"Every creative act empowers every other creative act." I set two intentions for my art last year: make it available on clothing; and paint pictures of local Austin animals to raise awareness of conservation issues. Both of those dreams just came true. Plus, I'm participating in a dialogue next week on art, culture, and spirituality with acclaimed author and Kabbalah expert Dr. Marc Gafni – and I've been playing with my new GoPro camera and have some fun time-lapse videos for you. Thanks for reading and have a magnificent weekend! Dye-sublimation is the only way to get vivid, high-resolution printing on the entire surface of your apparel. Ravenectar is a new label out of Montreal whose mission is to make visionary art available on t-shirts. 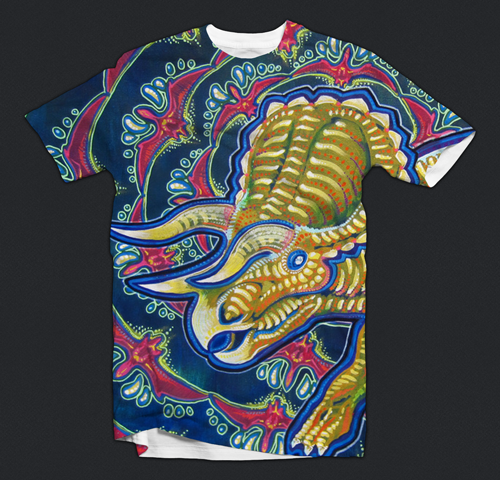 It's a match made in heaven – and their mockup for the shirt with "As Awesome As Three Unicorns," my painting from Sonic Bloom 2012, is the most popular concept so far. If you're a dinosaur dork, this shirt is a no-brainer. 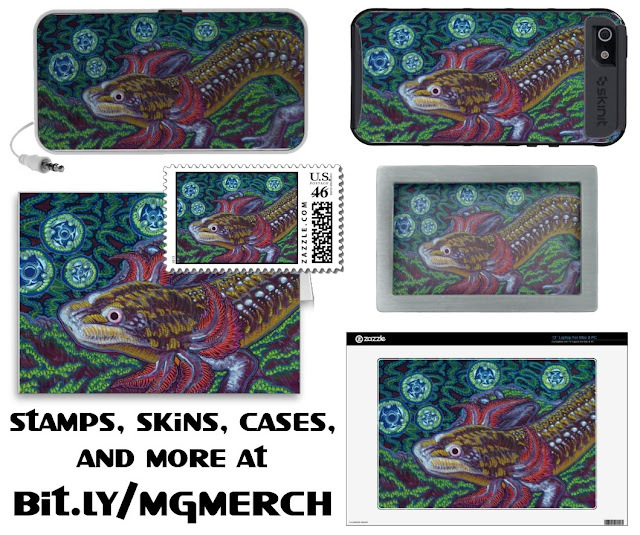 Contribute to Ravenectar's kickstarter to preorder yours today for less than retail price! Austin's Barton Springs is home to a totally unique salamander that exists nowhere else in the world. I painted this to raise awareness of the valiant efforts by Save Our Springs Alliance to preserve the habitat of this beautiful creature, and to alert people to the importance of the Edwards Aquifer in general – which is also the source for clean water for millions of people, and is currently endangered by both deregulated development within city limits and secret fracking about 40 miles west of Austin. Wherever you live, take care of it. Other creatures depend on you. If you live nearby, you can support the Save Our Springs Alliance by donating here. For SXSW in Austin this year, my live painter friends and I decided to go big and paint a mural on the side of a bus. BusToShow let us borrow theirs – they use this decommissioned school bus to provide safe rides to and from concerts across the country while raising money to support the arts. We set up in the side yard outside Whomp on South Lamar and The Boston Boys were gracious enough to join us with their tasty live music while we worked. It was one super magical afternoon. 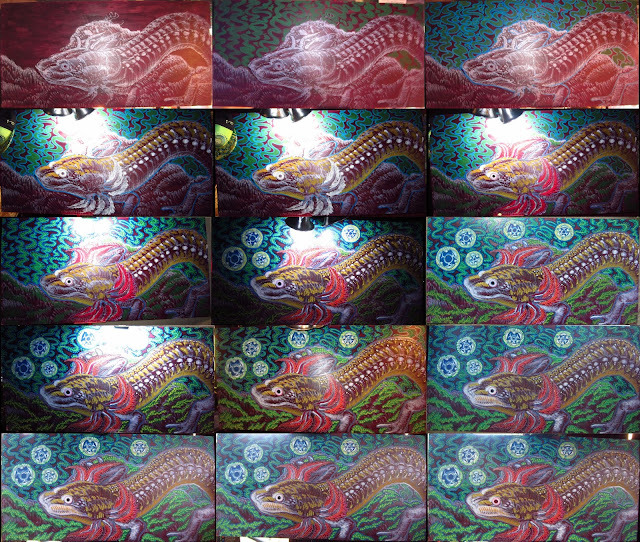 We didn't get to finish the mural, though – so stay tuned for part two! It doesn't take a genius to realize I am one fierce dinosaur fanatic. Here's to hoping the people at Universal Studios appreciate my new ink (courtesy of Lily at Austin's Golden Age Tattoo) enough to give me a free ticket to the 20th anniversary 3D re-release of Jurassic Park...! Either way, my slain dragon now rides shotgun, forever. This coming Tuesday, April 16th, I have the amazing opportunity to join Marc Gafni for a discussion on the transformational power of visionary art and the evolution of planetary consciousness. Marc is the author of Your Unique Self, a groundbreaking book that examines the role of the ego in spiritual evolution and how to live as a whole, balanced person – embracing the whole spectrum of human experience. Register here to dial in or stream online for free. If you're as curious as I am to explore how the Unique Self teaching applies to creativity, community, and identity in the electronic age, then join us on the call this Tuesday at 8 pm Central. Details here.